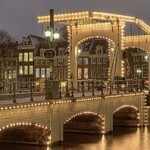 The Skinny Bridge, or Magere Brug, would in most cities of Europe not count as an attraction, but in Amsterdam it does. Compared to the Charles Bridge in Prague, or the Chain Bridge in Budapest it fades away, but in the context of Amsterdam it is special. The bridge as we see it today was built in 1934, and until 1994 it was opened by hand. Since 1994 it is opening itself automatically. 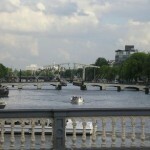 The bridge can be seen in a number of films, for example the James Bond film Diamonds Are Forever from 1971.